It’s Sunday, and you should have a little more time to devote to your marketing and what better way to do that than with a Podcast. Today we’ll be listening to the CD Baby DIY Musician Podcast and their thoughts of email marketing. Email and band newsletters are one of the most underused music marketing tools. Email newsletters are so underused when it comes to promoting (and selling) your music, tickets and gigs. 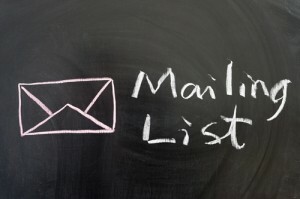 The folk at CD baby discuss how you can build and use an email list. email list Your artist story is what engages both the media and fans and helps put your music in context. The content about emails is at the 14 minute mark. Listen to the podcast over at the CD Baby website.